appelez moi noémie: Tips from an expert consecutive all-nighter-er. I am a self-proclaimed expert and experienced in pulling consecutive all-nighters, yet to people's wonder, still remain fresh-faced. In the last six days, I've only slept in my bed TWICE! I believe this isn't uncommon to people involved in design industries (there's a reason it's called architorture). So, here's my tip on successfully (yet unhealthily) hacking your sleep during those high-pressure times. But do remember that, it takes you a few days to a week, to fully recover from fatigue, and pay off sleep debt. 1. Throw everything on your bed. Anything! And the sharper or more fragile the objects, the better! So, not your cat, toilet paper, and clothing. This is so that you won't fall into the temptation of the seductress that is your bed. No cats, because during moments of insanity, which you're bound to have, you'll become mad and extremely jealous of your cat that is curling up on your very bed and feel immense self-pity. So chuck on the bed those blenders, tea pots, picture frames, suitcases, guitars, shoehorns, lamps, corn chips, iPads, scissors, etc. 2. Stock up on sugar. Eat more food to compensate for sleep deprivation. 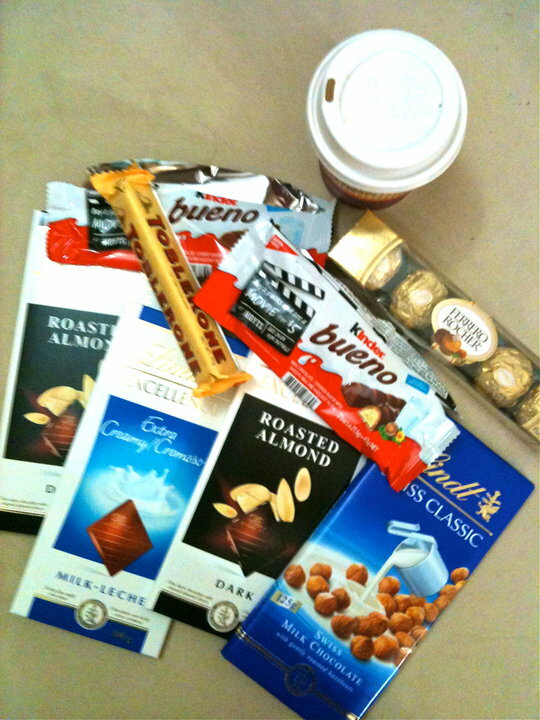 If you're not going to get energy from sleep, get it from chocolate. See Exhibit H.
3. Tell your family and friends to leave you alone. But still be active on Facebook/instagram/twitter. 4. Take 25-minute caffeine naps. No, not power naps, caffeine naps! Down an espresso and set your alarm for no more than 30 minutes. Because caffeine takes awhile to start having an affect, when you wake up the caffeine has kicked into full gear. Woo! 5. Music can be a life saver during an all nighter. Pick some music that's loud enough to keep you awake, but calm enough to not be a distraction. I also listen to empowering and encouraging Podcasts all throughout the night and morning, like "Your best days are ahead of you!" 6. Parcetamol and antihistamines are your friends. This unlikely friendship forms only because after a couple of days, fatigue brings a little stubborn friend along, the headache. 7. Colourful make-up. Because "wow, you look tired" isn't exactly a compliment. Don bright lipstick and blush to add colour to your dull vampire skin. Et voila! 8. Always know that there's more to life than study, college, assignments, and presentations.